“Nobody died.” Such was my immediate reaction to Collegiate, a credible story about what can remarkably easily happen during university ‘freshers week’, or ‘freshers fortnight’ as it more often than not tends to be the case these days. My own experience was resolutely more pedestrian than those of Tash (Rebecca Tubridy) and Kev (Stephen Love), and consisted mostly of sessions in the student bar with the younger students and spaghetti dinners in the homes of the ‘mature’ students. There was, of course, an element of boyish behaviour, but in a melting pot of a cosmopolitan central London campus, the sort of conduct that went on as detailed in Collegiate was largely confined to those who either had the challenge or the privilege of staying in halls of residence. What Collegiate explores, essentially, is the concept that certain young men who sleep around carelessly with apparent little consequence, while young women who do the same are branded ‘sluts’ and other derogatory terms. There are some very detailed descriptions of the central characters’ nights out during freshers week, down to what the bar looked like and who introduced whom to whom. But it’s all told in an agreeable and animated manner, and while the audience is only exposed to events from two perspectives, despite at least half a dozen characters involved, that is more than enough to provide much food for thought as events become increasingly gloomy. Both central characters are well developed in a strong script from Natalie Beech, which remains decidedly non-judgemental, giving a fair hearing to both sides of the same story. Here is Kev, with a mixture of charm and vulnerability, portrayed as someone who meant no harm, and fearful for his future with the possibility of a criminal record. Here is Tash, who may be understood by some off-stage characters to be indecisive as she flits between swiftly deciding to move on, before eventually filing a complaint, only to later withdraw it, but the audience is aware of the multiple dilemmas she faces as more and more information comes to light. Those details about what happened in the bar do serve a narrative purpose after all. There was the arguably inevitable frustration on both sides about policies and procedures, though I didn’t detect any diatribes or ramblings against the university hierarchy or the police service, and the play does well to maintain its focus on the individuals’ stories and what is going through their minds. The role of social media in these days of instant video-sharing and status updates is explored with some rigour. The play, rightly, offers no tidy answers to the issues it raises, no magic formula, no sweeping ‘if only’ statements. We don’t even find out what ultimately happens as the play ends on a cliffhanger. Is there a disciplinary hearing? Does everyone involved simply set the events of that one night aside and get on with their degree courses? And, as the famous book puts it, men are from Mars, women are from Venus, so will Collegiate remain forever relevant? 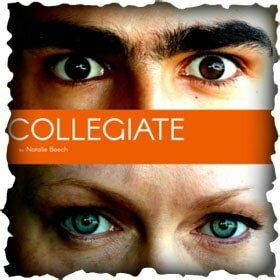 This is a fast-paced and absorbing play with the right amount of both humour and pathos. Well acted, well written and well done. University students Tash and Kev are battling their way through freshers, desperate to make friends and lost in the midst of lad culture. When they come together the consequences of cheap booze and cheap banter are more serious than they realised, and they spiral into disaster. Part dark comedy, part drama, Collegiate explores two student perspectives on the freshers’ experience – the highs, the lows and the ultimate consequences. This production contains bad language.